Early human embryos sometimes split into two and become twins. Some of these will even recombine to form one human embryo again. So, since individual human life isn’t established until sometime after the first few weeks of life, both abortion and embryonic stem cell research are morally permissible during this time. How would you argue against this reasoning? Give us your thoughts, and Alan will give us his on Thursday. – a point that needs to be questioned and thought about would arise from the use of the qualifier “permissible” in the argument. We’ll likely arrive at the conclusion that the argument really means “morally preferential according to a standard that I feel comfortable with” rather than “a moral standard that possesses sufficient warrant to validate the permissibility of any one particular action/event”. – another point in the argument, a “red herring” IMO, rests in granting that although human life may be established “at some point after the first few weeks of life” it is OK to terminate that life up until that human life becomes recognizable as “an individual” or “individuals”. This point does little or nothing to inform how we might validate whether or not the “early human embryo” in question is actually worthy of being deemed a “life” or “lives” that are morally permissible to terminate. if i heard someone ask me this Question i would ask them to “quote me an embryologist or scientist or agrees with there thesis?” because its not enough for them to assume human life dosent begin at Fertilization even if an embryo can split and recombine back into one. The argument itself admits in either case that it is human life. If it is indeed human life, whether the embryo remains a single individual within the first few weeks or becomes two individuals is irrelevant. One thing is for certain: there is at least one individual human life already established. And shouldn’t the possibility of destroying not one but two human lives be of even greater concern, anyway? It seems as though being an “individual” is an irrelevant distinction. Regardless of whether there is an individual, there is still at minimum one living human that is growing. Even if this argument was valid, it still doesn’t help the abortion advocate since most women don’t even know they are pregnant until well past the “first few weeks of life.” So using their own logic, abortion is not morally permissible past the first few weeks of gestation, which would eliminate the vast majority of abortions. If we cut a flatworm in half we get two flatworms. Does it follow that there was never a distinct flatworm to begin with? This objection does nothing to refute the scientific evidence that from the earliest ages of development, the unborn are living, distinct and whole human beings. Even if they may split or later recombine, it does nothing to prove that there is no distinct human being prior to the split. True, we don’t really know if the process causes the original organism to die and give rise to two new embryos or if the original engages in some sort of asexual reproduction, but this does nothing to refute the case that there is a distinct human being prior to the split. Also, would it follow that any one of us can potentially be cloned, none of us are distinct human beings? Finally, seeing as only a very small percentage of embryos even have the capacity for twinning and it usually will occur prior to a woman discovering she is pregnant, this objection is nullified all together. 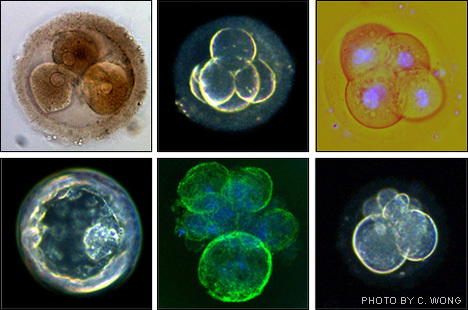 There is a spectrum of personhood, from none (single cell) to plenty (baby). Pro-life advocates agree with this spectrum when they focus on late-term abortions rather than Plan B. Please don’t forget that the point on the spectrum at which the embryo possesses its own unique DNA is not a fuzzy point. It is quite clearly and specifically delineated. The reason to focus on late-term abortions isn’t because they think there are different degrees of personhood, it’s a tactical decision. I don’t see any way to separate “human being” from “personhood.” Human beings, by definition, are persons. Regardless of their current ability to express it.